Memories, both in individual and collective form, still have a significant impact on how people relate to political processes in Europe today. While much has been written about top-down attempts by states and political actors to mould people's memories of the past through public commemoration, textbooks or monuments, this volume takes a view from below by focusing on different types of societal actors and the ways in which they interact with the political world in order to influence collective memory. Presented within a comprehensive conceptual framework, the empirical cases focus on three countries of the former Soviet Union: Estonia, Latvia and Lithuania. They show that different or even antagonistic perceptions of the recent past not only appear between different ethnic groups, but also between socio-economic groups, different age groups or generations as well as between women and men. Moreover, they give an impressive account on the multiple ways in which these perceptions empower individuals and groups to seek greater influence in the construction of collective memory. The volume, therefore, not only provides a valuable and fresh perspective on the relationship between social memory and democratic politics, but also contributes to post-Communist regional studies in the enlarged European Union. 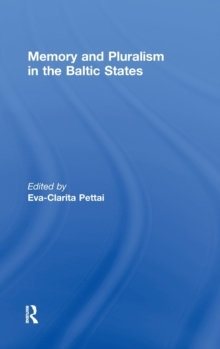 This book was published as a special issue of the Journal of Baltic Studies.